Give your bedroom a look of sophisticated style and exquisite comfort with this California king headboard. 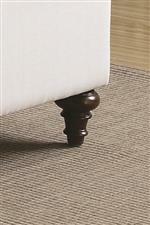 This piece is draped in a beige fabric that features diamond button tufting, along with individual nailhead trim along the sides, which provides unique personality. Furthermore, the rolled headboard design presents a detail that makes this more than just a normal headboard. The Devon California King Rolled Headboard in Beige Fabric by Coaster at Furniture Discount Warehouse TM in the Crystal Lake, Cary, Algonquin area. Product availability may vary. Contact us for the most current availability on this product. With this collection of upholstered beds and headboards, you will have a bedroom that is both extremely comfortable and elegantly stylish. Fabric options come in beige, white, and grey so you can choose a look that fits your personality. Additionally, details like nail head trim and diamond button tufting provide sophistication to a bedroom you'll love spending time in. The Devon collection is a great option if you are looking for Contemporary furniture in the Crystal Lake, Cary, Algonquin area. Browse other items in the Devon collection from Furniture Discount Warehouse TM in the Crystal Lake, Cary, Algonquin area.